Consignment clothing and accessories, designer goodies, vintage treasures, amazing costume pieces, estate jewelry, vendor booths, glassware, collectibles, patio sets, records, vintage toys, home decor, unique furniture, yard goods, western and hawaiian attire like crazy, formals, good deals all over, and if we don't have it.... be sure to check out our neighbors! 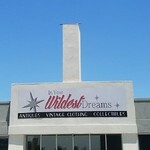 We are located across from serveral other antique malls- Central Park, Mill Creek and Great American Antiques. Come say hi to the Dream Team! We would love to see you and give you a tour of our new location. Don't be afraid to ask your friendly cashier where a good place to grab a bite to eat might be..... Lots of great local spots near us!